Psycho-Pass: Mandatory Happiness Review - How Dark is Your Hue? Psycho-Pass: Mandatory Happiness Review – How Dark is Your Hue? Notable developer 5pb and NIS America have partnered up to release a new visual novel in North America, gracing more platforms that just its original Japanese release on the Xbox One. Psycho-Pass: Mandatory Happiness is now available for the PlayStation 4 and Vita handheld, with a PC (Steam) release planned for 2017. 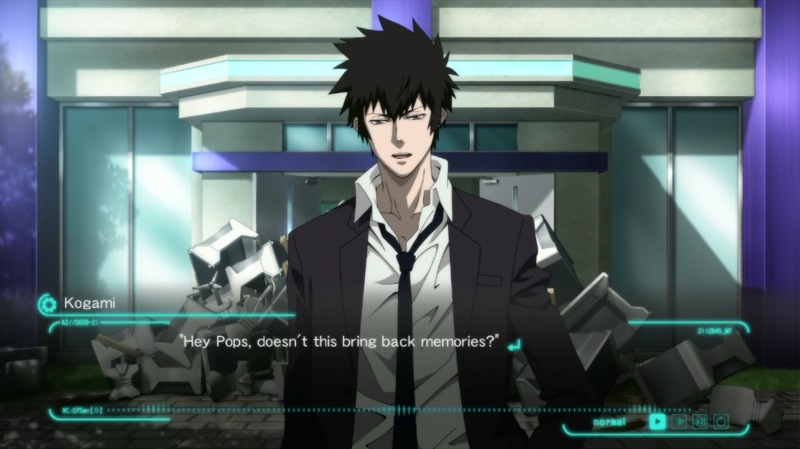 As a title marketed towards veterans of the Psycho Pass anime, much of the enjoyment comes from being a supplemental game rather than first encounter with the CID. Offering a non-conventional approach to visual novels, Psycho-Pass: Mandatory Happiness offers the role of two distinct characters to see through the narrative. Inspector Nadeshiko Kugatachi and Enforcer Takama Tsurugi each have offer a unique view upon the events that transpire in future Tokyo, with the latter having to be reined in like a mad dog given his status in the department. That’s due to Enforcers, just like other latent criminals in the world, have the potential to deviate from the social norm and perform some terrible deeds if given the opportunity. All of this is explained through a series of pre-crime screenings and a color-based profiling system that establishes ones’ ‘Crime Coefficient’ based upon the colored Hue represented. Psycho-Pass: Mandatory Happiness does some intriguing approaches to the story formula in terms of managing Tsurugi’s Hue. A major plot point of the series, a person’s Hue represents their emotional balance with an easy to judge gradient system. If one’s Hue becomes too dark or cloudy, it’s usually an indicator of a possible mental breakdown and increase of ‘Crime Coefficient’. These affected victims are usually whisked away by the police force’s pre-crime division of the Criminal Investigation Department (CID) for treatment or other forms of reconditioning. On occasion, some members (Enforcers) are drafted up by the CID to be brought back into society for the sole purpose of taking care of criminals much like themselves. The lore of Psycho-Pass can be daunting to take in all at once, especially for first timers that haven’t had a chance to view the animation series before. A helpful in-game glossary covers the basics on characters and important plot devices; however, the narrative drops the player right into an investigation and assumes that they already can piece together the major players and investigative procedures. Terms such as ‘Enforcer,’ ‘Inspector,’ ‘Dominator,’ and ‘Crime Coefficients’ are all dropped in regular conversation and it’s important to do one’s research on the CID before picking up Mandatory Happiness. The developers recommended watching at least the first six episodes of the anime series, as this stand alone story takes place before certain major events occur in the show. Mandatory Happiness, despite its appearances matching that of the television series, plays as a simple choose-your-own-adventure style visual novel. This means no quick time events, no elaborate puzzles or feats of dexterity to persevere. Along the journey are various turning points where the player has to make a decision on leads to chase or whether to take their government-issued medication if playing as Enforcer Tsurugi. Certain choices may darken the player character’s Hue and lead to an early defeat, though the player would have to intentionally be trying to screw things up to reach one of these endings. From a visual standpoint, Psycho-Pass: Mandatory Happiness does not fail to impress. With the same visual fidelity as that of the animated series, Psycho-Pass’ characters and settings are immediately recognizable. As is the case with most visual novels, much of the game’s visual effects are handled in static shots with major events only gaining two or three extra scenes for the action. Much of the events transpiring are presented through text and voicework, both of which have been dutifully localized without leaning too heavily into Western tropes. Those looking for some flashy high-budget animation might have to set their sights on the anime rather than its inspired game. Some modern conventions of the novel-based gameplay make Mandatory Happiness an enjoyable title to replay, although some features are conspicuously absent. A handy text skipping function can bypass all text that the player has already read. This makes discovering future routes an easier endeavor the second time around. However, there’s no indication of which options the player had chosen in a previous playthrough. Knowing which ‘flags’ have been triggered for social events with the various cast members can be difficult to discern (a brief popup shows affinity gains with specific characters, but it’s difficult to keep track of which key character events you can trigger). Special one-off character events help to fill out the story of Mandatory Happiness and give the player some additional time with key players from the anime depending on the choices made. On one route with Tsurugi, I discovered an event with notable antagonist Shogo Makashima over a cup of tea. It didn’t serve much purpose to propel the narrative of Mandatory Happiness but is a nice little nod to those familiar with the show. Beyond the special events, much of the story plays out the same from run to run. There may be different approaches to take in a tense situation, but often times so many of these diverging routes will reach the same conclusion. That is, assuming the player doesn’t succumb to a bad end early on. Mandatory Happiness is a tough sell for fans that are looking for the next Phoenix Wright or Zero Time Dilemma. Fans of the anime series can revel in spending another few hours with their favorite characters and might even be considered a mandatory assignment for those interested in the CID. PlayStation 4 version tested (review code provided by publisher). Also available on PS Vita; PC version due in 2017. Established fans of Psycho-Pass can revel in spending another few hours with their favorite characters and might even be considered a mandatory assignment for those interested in the CID.